The work of the utility is directed at opening new market orders, maintaining them, transferring the unprofitable orders into profit using an internal loss handling algorithm, trend filtering and various types of trailing stop and take profit. Suitable for any instruments and timeframes. The algorithm works separately for buys and sells, which allows simultaneously working in both directions as well. For the event when the additional orders opened by the utility do not become profitable, a StopOut (closing all trades by loss) is provided. It can be used as a supplement to trading strategies, and also as a full-fledged separate trading system. You can check the utility in your terminal's strategy tester in the Visualization mode. Deposit load - shows the deposit load percentage. StopLevel - Stop Level of the selected instrument in points. Drawdown/Grown - Drawdown/Growth of the trade balance as a percentage. Spread Value - Spread in points. In Deals - Volume of open trades in lots. Close Buy - close all opened buy positions and buy pending orders on the selected instrument, if the Magic Number of the order matches, and displays the profit/loss of the opened buy orders in the deposit currency. Close Sell - close all opened sell positions and sell pending orders on the selected instrument, if the Magic Number of the order matches, and displays the profit/loss of the opened sell orders in the deposit currency. Close All - close all opened positions and pending orders on the selected instrument, if the Magic Number of the order matches, and displays the profit/loss of the opened orders in the deposit currency. Open Buy - send a Buy order and display the volume in lots for the next Buy order in the queue. Open Sell - send a Sell order and display the volume in lots for the next Sell order in the queue. Lots - volume of the first trade in the group of orders, in lots. Slippage - allowable slippage in points. MaximumLotsValue - the maximum allowed volume of one order in lots. MaximumSpread - maximum allowable spread for opening orders. MaximumOrdersInWork - the maximum allowed number of orders. Order_Comment - comments to orders. Long_Trades - allow buy trades. Short_Trades - allow sell trades. Auto_SL_TP - allow setting TP and SL for the utility's order automatically. 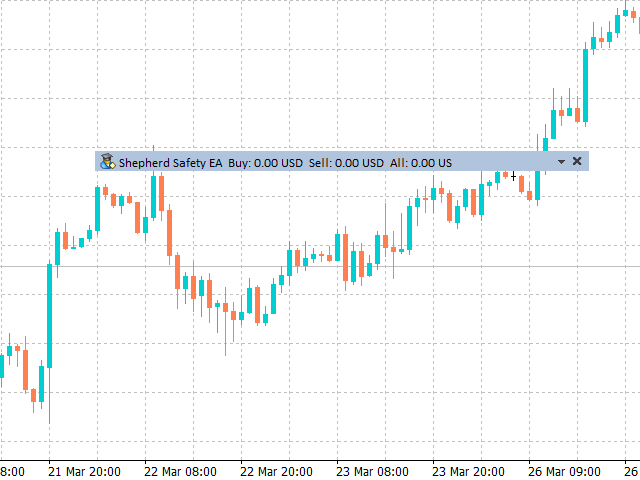 Overlap_LH - allow using additional trailing in money for the uppermost and lowermost orders of the group (separately for Buy and for Sell). Trend_Filter_Grids - filter type for order grids. Multiplier_Type - multiplier type for order grids. Step - step for the order grid in points. Multiplier - lot multiplier in the Multiplier_lots mode. Add_Lots - lot increase in the Add_to_lots mode. TakeProfit_Type - type of take profit or trailing. TakeProfit_money - take profit value in money. TakeProfit_points - take profit value in points. TrailingStep_money - step of the virtual trailing in the deposit currency. TrailingStart_money - start of the virtual trailing in the deposit currency. TrailingStep_points - trailing step in points. TrailingStart_points - trailing start in points. StopLoss_Type - type of stop loss. StopLoss_money - stop loss value in money. StopLoss_Points - stop loss value in points. StopOutValue - amount of loss in the deposit currency, at which all market orders are closed. Всем привет!!! На днях взял эту сову, и пожалел, что у меня её не было раньше :) !!! Убыточный,и безнадёжный в перспективе ордер другого бота в 120$ вывезла в плюс! Единственное, нужно подстраивать её по данной ситуации. Разработчик объяснил функции основных настроек. Доволен приобретением, по праву заслуживает пять звёзд! I can't believe how good this EA is. If you are struggling as a manual trader then this is the perfect tool for you. My favorite tool for trading, SS EA been really helping me to handle my trades. For those who like manual trading this is one of the tools you need. With the right settings and risk management, you will make money with it. Highly recommended. Excellent EA to help with my manual strategy. Thanks Alexander! Very Good EA for recovery .... Apply this EA on loosing trade and forget everything...It will convert the losing trade in to break-even.. Deserve 5 Stars. But remember as this is based on grid , so must be careful for the multiplier and accordingly must have that much fund Otherwise in no time you will be out from market with very heavy losses.. The code has been optimized, now the utility consumes less computer resources. Проведена оптимизация кода панели утилиты. Теперь программа потребляет меньше ресурсов компьютера. 4) Overlap LH - allow using additional trailing in money for the uppermost and lowermost orders of the group (separately for Buy and for Sell). 3) Highest - close the uppermost Sell order. - Added the limit on the maximum spread for opening orders. - Added selection of the comment for the EA orders. - Added trailing in points, take profit and in points and in money. - Added stop loss in points and in money. - Added a trend filter for the increased orders.